Somehow, I managed to get the Crystal Peaks bgm from Hollow Knight stuck in my head. Yes, they are. 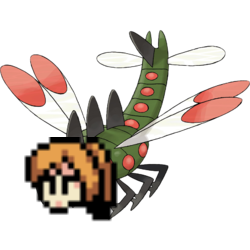 Also, to celebrate the release of Beta 3.5, have this newly discovered breed of Megan: the Yanmegan. For me, Lucas > Ness in general. Lucas feels like he has much more of a personality than Ness, and he also has a better design imo. The typical teen African American stereotype. Speaking of stereotypes actually, I also don't like them because they are over-generalized and, in some cases, kinda derogatory. When you loose connection during a game of Smash and you end up getting banned from online play for like an hour due to something out of your control. Very annoying to deal with. Alright then, I'll do this. Ness of course, the PK Thunder will always follow you in your dreams.